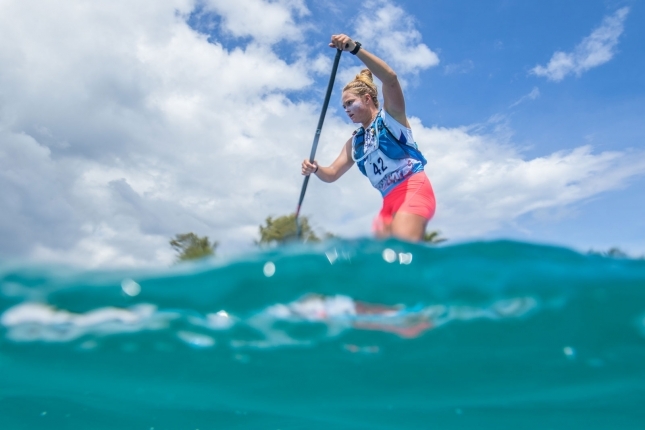 German powerhouse Sonni Honscheid has flexed her muscles and shown she’s a genuine contender for The Paddle League World Title this year, dominating the elite women’s field in sweltering conditions to defend her Air France Paddle Festival title in Tahiti. After a hard fought 8k “Lagoon Race” earlier in the day, where 15-year-old Leeloo Desanti showed she’s a name to watch for the future, it was a hectic start to the small but hyper elite women’s long distance race. With a field that included four of the top six seeds and arguably the number one dark horse in the sport, reaching the podium was always going to be a mission. Throw in the blazing hot blue skies and high humidity, and victory would have almost seemed like a mirage. After getting caught behind at the start, the 3x Molokai champ broke the field early and paddled solo around 24km course, looking calm and in control despite the South Pacific sun doing its best to slow her down. Showing the type of form that’s earned her the past 2x EuroTour crowns, Sonni opened up a huge lead and was virtually out of sight for every other competitor… except one. 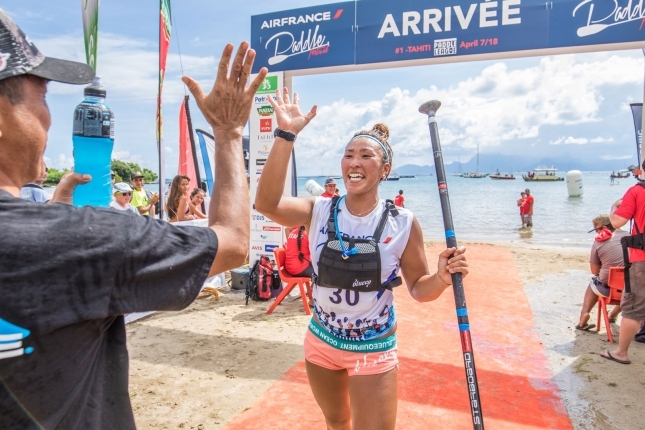 While the headline of this year’s race is certainly Sonni Hönscheid’s masterclass, another big story to emerge from the Air France Paddle Festival is the strength of runner-up Yuka Sato. 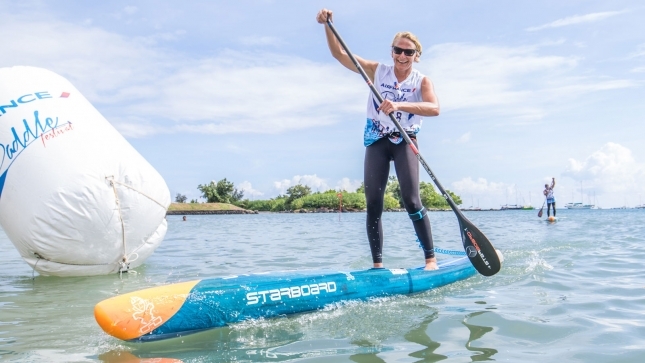 The Japanese dark horse proved her win at the 12 Towers last month was no fluke, staying within shouting distance of Sonni for most of the race to surrender less than three minutes over nearly three hours of paddling. Sonni was full of praise for her humble team mate, telling us that no matter hard she paddled Yuka was always within range. And in a sign of how competitive the women’s sport is becoming, Yuka will be leading the new-look Paddle League World Rankings when they’re revealed this week (including results from the pre-season events). Yuka is one of the happiest paddlers you’ll ever meet, and her always-on smile stretched from ear-to-ear as she crossed the finish line. Fiona earns 60 points for her performance and will be looking for even more in Carolina on April 21, the next stop of The Paddle League World Tour and an event where she’s a serious contender given her runner-up finish in 2017 and the expected absence of defending champ Annabel Anderson. 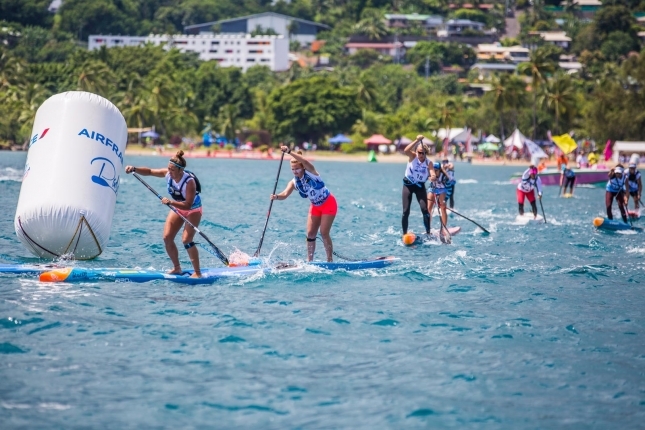 Despite the onslaught of international stars, Sylvana Ozbõlt salvaged some pride for the home team with a determined top five finish, while the Tahitian sun claimed a few scalps including Molokai Queen Penelope Strickland. Pea was hospitalised after the pre-season Hoe Toa event in New Zealand two weeks ago, and doctors advised her against competing this weekend at all. “An expensive holiday but still good fun” was how the ever-positive Kiwi summed up her day. But the day definitely belonged to Sonni, and given how comfortable her victory looked on Saturday she’ll be odds-on to collect another 100 Paddle League points in Carolina where the women’s field is going to be intense. If she can pull off the double, that would set her up for a serious crack at the World Title in the middle part of the season, when The Paddle League heads for the EuroTour and a part of the world where Sonni is virtually unbeatable. Congratulations to everyone that got out on the water for a fun but extremely draining day of racing. It was a pleasure to call the action from the live stream booth alongside our awesome partners at TNTV and TotalSUP, and we’ll be focused on providing the women more screen time during the Carolina Cup. Results below, and you can also catch up on our recap of the Air France Paddle Festival elite men’s race.